They are zucchini cupcakes (I had two that didn't make it into bentos this week so I needed to use them up) with maple cream cheese frosting. The frosting is a little sloppy because I was a bit rushed to get them done before my swimming lesson. They're definitely yummy, but they're a little heavier than using a cake mix, so I still have some learning to do. I decorated them with some maple leaves I made from fondant. I used pale green fondant, drew veins in them and painted with diluted red food colouring to give them a textured colour. On the pink ones (I'm still figuring out how to make dark icing without a wonky taste so that's why they're not red), I sprinkled Skor bits, and on the white ones I drizzled a little fresh maple syrup that my dad brought me from a maple syrup farm a couple weeks ago. A lot of times I sleep in or whatever and think I don't have time to make bento, but really, there's no excuse because bento making takes me as long as I have. If I have 5 minutes, it takes 5 minutes, and if I have 40 minutes, it takes 40. The trick is to multitask. Most mornings I have at least 3 out of 4 burners going on the stove, plus something in the microwave, and I'm chopping something up at the same time. This morning I had 11 minutes. Here's a snack bento that I put together. 1. Boil some water in a kettle. While it's heating, cut out some flowers out of a slice or two of sweet potato. Heat some canola oil in another frying pan and a little water in another pot or steamer. Pour the water you just boiled into a small pot. 2. Add edamame and sweet potato to the boiling pot of water. Remove and strain after six minutes. 3. While that's going, throw some frozen pork shumai in the pan with oil. Periodically flip and smoosh with a spatula until cooked through. 4. Now you've got two things cooking. Slice up two stalks of asparagus, a couple of broccoli florets and two sugar snaps. Put the asparagus and broccoli in the steamer for 3 minutes. Add the sugar snaps and steam for two more. 5. Now you've got three things going. Heat a frozen onigiri in the microwave, about 20-25 seconds on each side. 6. Pour some tonkatsu sauce (or whatever your favorite dipping sauce is for pork) in a small container. 7. Slice up a strawberry. 8. Everything should be ready by now! Place onigiri in the bottom right of the left compartment. Place shumai above the onigiri and asparagus to fill in the gap on the left. Slice sugar snaps in half and tuck into the gaps. Cover the rice with edamame and position sweet potato flowers on top of it. 9. Place sauce container in the top left of the right hand compartment. Cover it with strawberry slices. Place any remaining edamame below the strawberryt. Place broccoli florets beneath the strawberry, and two cherries below that (on top of the edamame). Fill any gaps with blueberries. 10. Rush out the door! So that's how I do it. And at 3:30 this afternoon when I was starving because lunch was hours ago, I had something delicious and healthy to snack on. It's a good thing too, because there was an open box of donuts in the office! I managed to fit in two pieces of pork shumai (homemade), one heart shaped onigiri filled with red bean paste, a quail egg, three bites of asparagus, three broccoli florets, two sugar snaps, two fiddleheads, three fried plantain stars, two tangerine wedges, two bites of fresh pineapple, a strawberry cut into small pieces, four blueberries and two raspberries. I think I did pretty well! And it was a perfect, delicious and well balanced snack. Here it is with the lid on. Today I started with a diamond in the center and then filled in the corners. I think it turned out pretty nice and it was definitely yummy. I tested out my rice cuber for the first time. The yellow rice is coloured with tumeric, the purple rice is flavored with shiso furikake and the white rice is plain with salt. I purchased the cuber from this ebay seller along with some other rice molds a few weeks ago. In the top right corner there are a couple of gyoza. Bottom right is breaded pork cutlet pieces and asparagus bites. The other corners are foods that are in season here, fiddleheads and rhubarb. To make the rhubarb, I took 1 chopped stalk of rhubarb, and 1 chopped strawberry, chopped and simmered them in a pot with about 2 Tbsp water until everything was soft and mushy. Then I added 2 Tbsp sugar, stirred until dissolved, removed from heat, and finally added about 1/2 tsp cornstarch dissolved in a little water to thicken it up. Rhubarb to me is just one of those tastes that brings me home, I love it. There are also some sugar snaps, carrot flowers and broccoli floating around in there. For fruit, there are a few slices of fresh pineapple, raspberries, blueberries, a little more strawberry, and a couple of slices of kumquat. The kumquat was so tart and tangy, it's a great way to cleanse your palate between bites. Dessert was a date square. Today I had my very first restaurant bento. Since it's memorial day, BF and I had the day off. On our way to the grocery store, BF commented that it since it was lunch time, all of the restaurants would have lunch specials. Although the food was good, I was struck by two things as soon as the bento boxes were set on the table. There was less variety of food than I was expecting. My bento contained a garden salad, a chicken breast, vegetable tempura, white rice and an orange slice. Miso soup was served on the side. The boxes were huge! About the size of an average placemat. And the portions were huge as well. I felt like I was eating salad for ages, and in the end I only finished half of it. Same thing with the rice. Unfortunately, I didn't have a camera with me, because I wasn't expecting to go out to lunch. Overall, I felt a bit disappointed because everything I've read about Japanese cuisine has emphasized the importance of portion control and the health benefits of eating a large variety of different foods. These bentos seemed 'North Americanized' by comparison. My frustration was compounded by the fact that I know this restaurant has dozens of delicious dishes. I ended up thinking of all kinds of different combinations of their food that would make amazing bento lunches as I crunched away at my salad. Has anyone else had an experience like this? I found myself wondering if a restaurant could do good business serving properly portioned authentic bento lunches, or whether as a city we're all too used to supersized meals. Since I started making bento, I've amassed quite the collection of cookie cutters and ham & cheese cutters. I found another fun use for them...cupcake decorations! On Saturday mornings I like to clean my kitchen from top to bottom, and since I'm there anyway it's a great time to bake something, so these are this morning's cupcakes. The theme was (obviously) tigers. The cupcakes are a basic vanilla that I filled with chocolate hazelnut fudge. The icing is buttercream, and the tigers and stars were punched from rolled fondant. It actually didn't take much thought to put the tiger faces together, because I've made so many faces on onigiri. It's a little hard to tell from the picture but I used orange for the face, yellow for the area around the mouth and pink triangles for the ears and nose. Cute and delicious! My favorite kind of food! Last night I felt like I'm starting to come down with something, so I decided that today's bentos would be made entirely with my favorite foods. On the top we have some chicken sushi. This was my first attempt at making maki rolls with the soy paper (mamenori) and it was delicious and held up really well in the bento. I braised strips of chicken thigh with 1 Tbsp sake and 1 Tbsp ponzu sauce, and rolled them with a strip of green pepper and two chives and then sprinkled them with black sesame seeds after cutting the roll into pieces. They were juicy and crunchy, it was a great combination. There are three gyoza and my favorite salad of chopped lettuce, mashed avocado and honey. For veggies there are edamame, a few sweet potato flowers, broccoli, sugar snaps, a couple of pieces of asparagus and a few fiddleheads. For fruit there are apple slices, tangerine wedges, cherries, strawberry slices and blueberries. This is BF's bento so there's a truffle for dessert. We have a bonus picture today! This is Macaroon, my hedgehog. He went in for surgery yesterday to have an infection removed from his ear and to have his legs examined. I guess they just put a little gas mask over his face to knock him out. We bought him a few months ago from someone who didn't take good care of him, so he wasn't very healthy and he's never been able to walk properly. Since his surgery yesterday though, he's been the happiest and most active I've ever seen him. We have some antibiotics to give him, so I'm hoping that he will be even healthier in the next few weeks. He was up this morning chilling with me in the kitchen while I made bento, so I thought I would share a picture of him. He's such a wonderful pet, I just love him to pieces. BF said he thought today's bento was 'particularly tasty' so I consider that a success. There was some leftover stuffed porkloin (it was a huge cut of meat) from yesterday's bento, so we had repeats today. To add a little more protein to the bento, I made a rolled omelette with three eggs, chives, chicken broth and a little soy sauce and sugar and included a few slices in each bento. In the top right we have soba noodles. I was really surprised at how yummy these were, I thought they would be plain. Buried underneath them is a small container of dipping broth (a sharp, salty combination of chicken broth, soy sauce and mirin). I couldn't figure out how to twirl them around chopsticks to make a nest, so instead I just laid them in the silicone muffin cup by hand. It only took a couple of seconds. For veggies there is a mixture of corn and red pepper (leftover from fajitas last night ), asparagus, broccoli, sugar snaps and fried plantain butterflies. I learned a new way to cut carrots yesterday, so I included a few of those to practice my cutting skills. There are blueberries, strawberries and persimmon bites for fruit. Dessert is some homemade baklava. I made a batch last week and froze it. BF was taking the pictures this morning and he's more creative than me when it comes to that stuff, so here's another shot of the bento. Ooh, angles! Fancy! I didn't intend for today's bento to turn out so cutesy...it just kind of happened! I found some mini sweet potato pies in the freezer from a batch I made a few weeks ago, so I thought they would be nice in today's bento. I decorated this one with mozzarella and cheddar flowers. The onigiris are from last week's frozen batch. The bunny is plain, the tiger was coloured with tumeric and rice vinegar, and the elephant was coloured with purple yam powder and rice vinegar. Accents are nori and ham. There's also a heart shaped onigiri made with coconut rice and a nori accent. It was nice to have so many different onigiris because it adds some different flavours to the bento. Underneath the onigiris are slices of a stuffed pork loin. The onigiris are really short, so they need to sit on something to elevate them, and that allows me to fit even more types of food into the bento! In the bottom left corner there is some steamed spinach with miso and ground sesame seeds. Other veggies include yellow and green zucchini, fiddleheads and broccoli space fillers (all steamed). There wasn't much room left for fruit so we have some blueberries, strawberries and blackberries. Yesterday I made cupcakes, and I ended up having some leftover batter, so I made a batch of mini cupcakes as well that turned out small enough for a bento box! It's a chocolate cupcake with red bean filling. The frosting is buttercream with some matcha green tea powder, and the cupcake is topped with a small ball of mochi. It was sooo decadent! I put the cupcake in a foil muffin cup in addition to the muffin cup it was baked in, so that none of the moisture from the fruit soaked into it. This morning was one of those mornings where I wished my bento boxes were just a little bit bigger. I wanted to fit so much more in here than there was room for. We got take out sushi last night because I was feeling lazy and we wanted a sushi late night snack. So there is some avocado maki, sweet potato tempura maki and a couple of unagi (eel) maki. Generally I'm nervous about putting fish sushi in a bento, but but the eel in unagi sushi is actually cooked, so it's not quite as scary. The main protein in the bento is a chicken 'tournedo' (basically bacon wrapped chicken thigh) that BF cooked up last night. There are two homemade gyoza sitting on top of some asparagus pieces. For veggies there is some sesame fried bok choy, sauteed red pepper slices, steamed snow peas, carrot flowers and broccoli, all tucked into the various nooks and crannies. For fruit there are blueberries and strawberries, the last of the cherries and half of an apricot. Dessert is a small piece of homemade whole wheat and walnut baklava (I made a batch last night to use up the rest of the phyllo from when I made spanakopita last week or whenever it was). I feel like out of all the bentos I've made, today's was the most outstanding yet in terms of making the most delcious food while keeping it pretty. Oh man, it was so yummy! I made tamagoyaki nigiri sushi. This was my first try making nigiri sushi and it was way easier than I thought it would be. I had no trouble at all making the rice balls uniform just using my hands. I made the rice last night and heated it in the microwave this morning, and it turned out nice and fluffy. I made the omelette last night as well. For enough omelette for two bentos I used three eggs mixed with 1/4 cup chicken broth, 1/2 tsp mirin, 1/2 tsp sake, 1 1/2 tsp sugar and a pinch of salt, and rolled it into longer layers than usual to give it the right shape. I refrigerated it overnight and in the morning I just had to cut it into slices and attach it to the rice with strips of nori. Under the sushi there is some sesame fried gai lon with dried cranberries. I never had gai lon before (or cooked it!) and I think next time I'll just steam it. The sesame oil was a little too sharp. Beneath that there are three home made pork shumai, fried in a little canola and pressed with the spatula to flatten after every flip. That was the end of the batch, so I will probably make more this weekend. At the bottom there is some broccoli hiding a soy sauce bottle, and this amazing little daikon salad. The taste of this salad is so incredibly sharp, so it has the same effect as pickled ginger with sushi. It's tiny but it packs a ton of flavor. To make it, the night before I sliced up some daikon and cut it into flowers with a punch. Sprinkle with salt, and then try to press/knead out the liquid in the daikon. Set the flowers on some paper towel and cover with plastic wrap in the fridge overnight. The paper towel will soak up even more of the liquid, so in the morning you'll have some really thirsty daikon. Also, the night before mix about 1 Tbsp white vinegar, 1 tsp sugar, 1 tsp lemon juice and a pinch of julienned orange peel and refrigerate overnight so the flavors mix. In the morning, add the daikon to the vinegar mixture and let it sit for ten minutes to soak it up. Drain the liquid and add to the bento. There are some sugar snaps, sweet potato butterflies and the first fiddleheads of the season, all steamed. I added some lemon juice to the fiddleheads. For fruit there is half of a honey tangerine and cherries! This was the first time I've seen cherries at the grocery store all year and they were $12 a pound if you can believe it. So I actually counted out ten cherries at the store (enough for bentos for two days). They were so delicious though, it was totally worth it. Then there are the usually strawberries and blueberrys, and a truffle. BF is so good to me. Last night he took me for sushi and on the way home we walked past a movie theatre. He suggested that we see a movie and I said I couldn't because I needed to get bento stuff ready. So he offered to get up early and make me a bento, even though it was his day off, and we went to a movie. In the top tier we have pieces of chicken breast fried with balsamic vinegar, dill, oregano and thyme. There are two onigiri, a red bean filled flower onigiri and a cat shaped onigiri coloured with tumeric (He took the picture before he put the face on it, but it was cute). My favorite part was a flower he made in the bottom left from a yellow zucchini slice and some snow peas. There are sweet potato teddy bears, broccoli, asparagus and steamed fiddleheads. On the bottom there is a gyoza, more broccoli, strawberries, blueberries and the last of the persimmon. I didn't help at all! BF is taking a couple of days off work, so you get to see my bento instead of his today and tomorrow! I tried out my new nori punches and mini onigiri molds today. On the bottom there are three onigiri. The elephant is coloured with purple yam powder mixed with vinegar, the pink heart is a coconut onigiri from the batch in the freezer and the bunny is plain with salt. None of them are filled. There are a few lamb bites in there (from a skewer from this weekend's barbecue), asparagus, broccoli and edamame. On the top there are three gyoza (I made another batch this weekend, we go through it like crazy! ), a boiled quail egg, more edamame and broccoli, star shaped coconut onigiri, persimmon bites, a fried plantain flower, strawberries and blueberries. Last night I was all set to make exciting sushi. I bought a frozen eel filet and was going to make unagi sushi because it's BF's favorite. It was going to have the unagi wrapped on the outside (because I haven't tried to do that yet) and avocado on the inside and it was going to be really pretty. I cooked the unagi according to the directions on the package and when it came out of the oven, I brought BF into the kitchen to try a bite (I don't like the taste of fish). According to him it was pretty bad. Unsalvageable even. So we had to toss it. He assures me that it just tasted like a low grade of meat, and had nothing to do with my cooking skills (this was the first time I've ever tried to cook fish). He's so sweet. As you can see, my lettuce wall building skills are improving a little. I tried using kale this time because it's firmer (although not as delicious as whatever lettuce I was using before). There is some avocado sushi, some pork bites underneath that, three home made gyoza (there's a bottle of dipping sauce hiding under them), slices of lotus root cooked in vinegar and water (finally, I made a bento where you can see the pretty holes in it! ), and asparagus. Fillers are the standard broccoli and sugar snaps. Last night BF made a yummy sauce with tomatoes, chicken thigh pieces, zucchini, asparagus and who knows what else, and there were leftovers! So today I did a donburi style bento lunch. The bottom is the sauce BF made, some more miso steamed spinach and some egg scrambled with chives. I know I had spinach and egg with my last donburi bento so I should have tried something new, but it was so yummy that I couldn't help but do it again. Everything is over a bed of rice. On the top we have a few spanikopitas, some cabbage/cranberry/walnut salad, plum pieces, a couple of snow peas, carrot sticks, berries and a pieces of lemonade flavoured fudge. It was a good bento, but it turns out I'm not a huge fan of tomato sauce at room temperature, so I'm not sure if I would do it again. 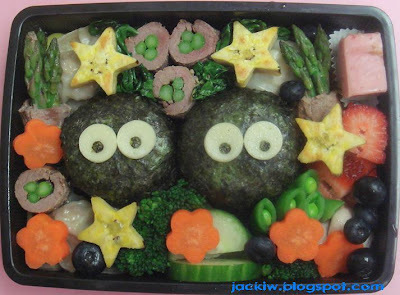 I guess sootballs are characters from the Japanese cartoon, My Neighbor Totoro, but I've never seen it myself. I just think they make cute onigiris! I molded the rice by hand (I didn't have a big circle mold) and wrapped with nori. The eyes are havarti and nori. I filled the onigiri with lotus seed bean paste, but BF said they would have been better with a big piece of fish inside so now I know for next time. I made beef and asparagus rolls, using the same recipe as last time, but I used shorter pieces of beef this time (about 2") to make a tighter roll. They were a bit tricky to make this small. I generally hold them together with toothpicks as they cook, so that they keep their shape. There are three pieces of asparagus for filling. I let the florette part of the asparagus stick out of the end to make a couple of prettier bites (near the top of the bento). There are three gyoza (I steamed them today instead of frying), and some sesame fried bok choy filler at the top. On the bottom there are a couple of pieces of broccoli and some sugar snaps. I fried some plantain stars and cut some flowers out of carrot. There was a little bit of space left, and I thought the bento could use more green, so I included some cucumber slices. For fruit there is a freaky little thing called a mangostein (I usually try to pick up anything that I haven't tried at the grocery store). It's the white bit in the bottom right. It tasted like a mango but was gooeier (is that a word?). I don't think I would repurchase. Then of course there are strawberries and blueberries, and lastly, a bite of strawberry fudge. On the bottom we have a large onigiri, half of a flower shaped egg, steamed asparagus and brocoli, steamed miso spinach, sesame fried carrots and some bites of marinated lamb. The top is two mini onigiris, a couple of sugar snaps, kiwi flowers, orange slices, strawberries, gooseberries, blueberries and a strawberry shaped chocolate. Today at the grocery store they had organic whole wheat phyllo pastry which I had never seen before. Then I remembered the bag of spinach in my fridge getting close to its expiration date, so I decided it was a good day to make spanikopita. It turned out so delicious! They're fluffy, crispy and cheesy with lots of flavour. A couple of quick notes about the recipe: These are really yummy at room temperature but be careful not to put them near anything moist (like fruit) in the bento or they'll get soggy. The most efficient way I've found to make these is to set up a production line sort of set up. I make eight or nine at a time which is way faster than making them one at a time. Ensure phyllo pastry is completely thawed. The best way to do this is to leave overnight in the refrigerator. Fry shallot in olive oil until translucent. Steam spinach until wilted. Squeeze out all of the liquid and chop finely. Combine spinach, rice, feta, parsley, dill, shallot, egg and lemon juice and mix well to make the filling. Cut phyllo into strips about 1 1/2" wide (the spanikopita should be small to fit snugly in a bento). Brush with butter. Spoon about half a tablespoon of spinach filling onto one of the ends and fold as shown in the picture below. You can fit quite a few of them on a cookie sheet! Bake for 17 - 20 minutes until outside is crispy and starting to turn brown. Recipe makes about 60. You can freeze these before they're cooked and then bake them in the morning when you make bento, or you can freeze them after baking and take them out of the freezer the night before to thaw. The main components are slices of stuffed turkey roll (premade from the butcher), lotus seed paste filled onigiri, home made spanikopita (under the ducks), and a small container of eggplant braised in a sweet miso sauce. I had half a sweet potato I wanted to use up, so I shaped some into flowers and made a couple of turtles (with nori). The ducks are fried plantain. There is some edamame hiding in the top left corner, and the regular broccoli, asparagus and snow peas. Fruit is persimmons, strawberries and blueberries, dessert is a truffle.